The Business Card Sculptures Baseball Player Sculpture is a perfect gift for baseball players birthdays, annual awards or retirement gifts! 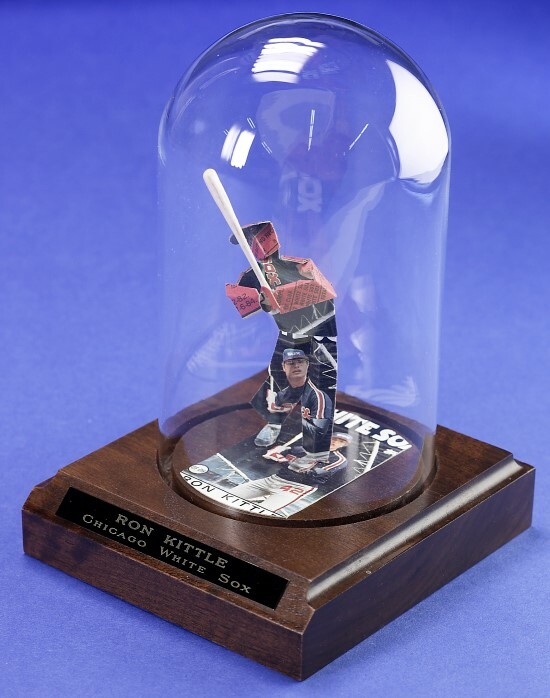 This was originally designed for former White Sox player Ron Kittle. Truly a unique gift for baseball players, coaches or lovers of the game. Mounted on a walnut base under a glass dome, it looks great on a desk or bookcase. You could even give it to a softball fan! Celebrate the athletic accomplishments of your family and friends with this unique sports gift. It’s a great way to thank a coach too! For other gift or award ideas, check our Sports Gifts (Fisherman, Golfer, Hockey Player, Skier, Tennis Player, Weightlifter) and Occupations categories.